I picked this one up because it was compared to Maureen Johnson's Thirteen Little Blue Envelopes and Gilmore Girls. Seemed like a no-brainer. But I feel like I should stop picking up books that are compared to something I love - they never really live up to the hype. Nora is an artist known for her cartoon drawings on Tumblr. She wants to seriously develop her art and live up to the expectations of her grandfather who is a renowned painter. After she is accepted into an exclusive art workshop in Ireland, he offers to send her on a once-in-a-lifetime trip around Europe, planning secret tasks that she must complete at certain locations. 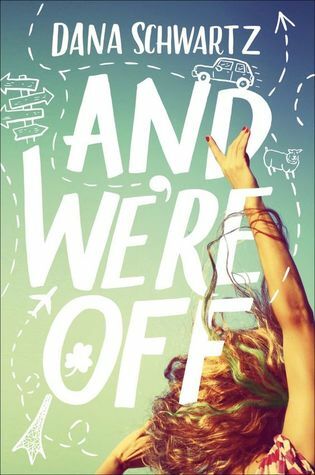 Nora is excited about the trip, but when her mother decides to tag along, the summer is far from what Nora imagined. The story was okay - there is always the frustration when two people refuse to communicate with each other causing a lot of strife. Nora's mother, Alice, is secretive and elusive every time she is asked about her job back home, and Nora is an angsty teenage girl who can be a little selfish and stubborn. There relationship evolves at the end, as was expected, with a relatively genuine moment when they actually start talking to one another. It was everything else that seemed a good idea but wasn't fully developed. Nora's secret tasks played a sadly minimal role in the story. I would have liked them to play a more prominent role in the story, along with the art workshop in Ireland. Friendships between the other artists and Nora were quickly made, but seemed thin, and Nora's frustration with her art came a bit out of the blue. As for the connection to Gilmore Girls - no. Just...no. I get it - mother / daughter relationship - but ALL Lorelei and Rory Gilmore do is talk. The show was founded on their quick, witty banter that showed how close they were. Not the case at all between Alice and Nora. The book did make me long to hop on a plane and do some traveling. It will happen soon enough when I take flight in July, but it wasn't quite the rummer European trip story that I was hoping for - not bad, just not as good as it could have been. It is, however, one book completed on my summer to-be-read list!